Ulhas Kashalkar, one of the prime representatives of Gwalior and Jaipur Gharanas, has earned wide recognition in India and abroad. He was initiated to music by his father Shri N.D.Kashalkar an able musicologist. A gold medalist at his post-graduation in music, he was later on trained by Pandit Ram Marathe and Pandit Gajananbua Joshi, stalwarts of Hindustani Classical Music. Gifted with a melodious voice, with superb flexibility, Kashalkar’s music appeals to every music lover. His gaykee is especially noted for pure traditional rendering with his own asthetic interpretation. Renowned cassette companies of India and abroad have brought out many cassettes and compact discs of his music, a testimonial to his immense popularity. He has performed extensively in India and abroad. Presently, he is associated with Sangeet Research Academy of Calcutta as a Guru. Short but very sweet article on today’s prominent singer Pt. 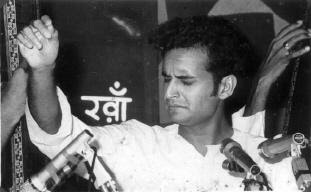 Ulhas Kashalkar. Just wanted to make some addition is that he also represents Agra gharana, apart from Gwalior & Jaipur. He took training from Pt. Ram Marathe & Pt. Gajananbua Joshi. Both were disciples of Pt. Jagannathbua Purohit & Ut. Vilayat Hussain Khan respectively-Agra Gharana. I am very happy to see this site. It is a great contribution to Hindustani Classical Music. My salute to the owners and contributors.